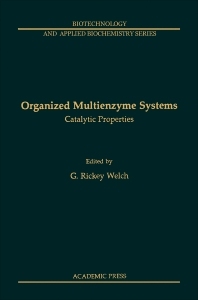 Organized Multienzyme Systems: Catalytic Properties describes the kinetic and catalytic properties of organized enzyme systems. This book is composed of nine chapters that specifically cover both immobilized and naturally occurring systems. The first two chapters examine the nature and function of enzyme organization in the mitochondrion, as well as the structural/functional coupling of the components in energy-transducing membrane systems. These topics are followed by discussions on ""dynamic compartmentation"" in soluble multienzyme systems; the allosteric enzyme systems; and allosterism in reversibly adsorptive enzyme systems. Other chapters explore model studies with specific immobilized multienzyme sequences, as regards the analysis of microenvironmental effects, and the mathematical exposition on the kinetic analysis of multienzyme systems in homogeneous solution. The last chapters present some theoretical and experimental studies on the behavior of immobilized systems. These chapters also provide a speculative integrative view of the kind of functional coherence that may be operative in organized states in vivo. This book is of great value to cell biologists, biochemists, and enzyme scientists and researchers. IV. The Protonmotive Force as an Intermediate in Electron-Transport Phosphorylation? VI. How Then Might Energy Coupling Proceed?